Kids go off to school to learn from their teachers. While at school, some of the kids get in fights. The school administration punishes the kids by suspending or expelling them. During the suspension or expulsion, sometimes the kids come back on school property. For example, the juvenile in J.A.M. v. State came back onto school property with his prom date for the school dance during his suspension, and he was charged with this crime. This Florida statute also prohibits anyone to remain after they have been told to leave by a school official. Sometimes this statute has been used as grounds to arrest anyone on school property or near it. Recently in Key Largo, some Gideons (members of an organization that hands out free Bibles) were arrested for violating this statute, and in Miami a news reporter was arrested for being on a public sidewalk near a school after police told him to leave. Police sometimes have an arrest first and then ask later mentality, which is bad for anyone caught up in the mess. You were a student under suspension or expulsion at the time you entered or stayed on the campus or any facility owned by a school. School property means any public or non-public kindergarten, elementary school, middle school, junior high school, secondary school, career center, college, or university. (2) The principal or the principal’s designee told you to leave the school property or facility. If the principal of the school is not telling the individual to leave, the state prosecutor must prove the person giving the warning to leave is the principal’s designee. See J.R. v. State. Trespassing on school property is a second-degree misdemeanor, which is punishable up to 6 months in jail and a $500 fine. 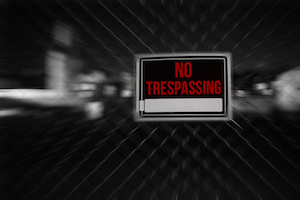 A trespass after a warning is a first-degree misdemeanor that is punishable up to 365 days in jail and a $1,000 fine. We serve the South Florida area and focus on criminal matters. If you have been arrested and charged with trespassing on school property, call our law firm today. We can set up a free consultation to explain to you your options and your legal defenses. We want to find out as much as you know so we can put together a defense for your case. We will fight your case all the way to trial; however, sometimes cases just cannot be won. In this situation, our attorneys will still keep on defending you by trying to convince the prosecutor and judge to change the charges or reduce the sentence through mitigation.